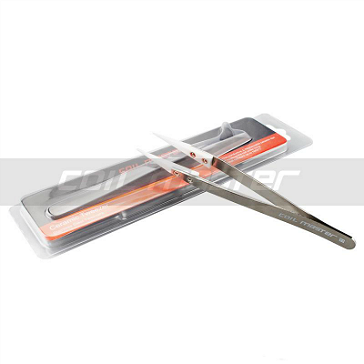 Perfect for precision adjustments, the ceramic tipped tweezers by Coil Master have stainless steel handles and are the most advanced tweezers in the coil building world. Ceramic tweezers are ideal when building microcoils or contact coils because you can squeeze the coil wire when the battery is firing (ceramic is not conductive). The coil won't short since it will not be touching metal, it won't get damaged when there is power going through it. Ceramic can also withstand the immense heat generated when you dry fire the coil.